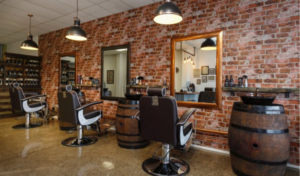 Found in Taupo, MANCRAFT’s impressive barbershop was crowned winner of the 2018 Best Salon Design award. We spoke with owner Patreece Corban to ask her about her new barbershop and give us some insight into what inspired its design. How does it feel to be the 2018 winner of Best Salon Design? We are very proud to have won this award by creating an innovative, new age barbershop. We couldn’t have done it without our dream team of amazing professional contractors that helped our vision come to life! What was the vision for your barbershop? The inspiration for MANCRAFT was a ‘boy’s club’ with a grooming den, created out of sustainable materials. The cool, masculine, recycled space that the team at MANCRAFT envisaged had to be functional as well as suit the needs of the men that it was trying to attract. Staying true to this vision meant that it took almost a year to settle on the final design. The design needed to fit the manly, rustic and sustainable brand positioning of MANCRAFT. The layout had to provide space for three barber’s chairs, grooming room, children’s haircut area, reception space, staff lunchroom, laundry facilities and sufficient storage. Every aspect of the design had to be environmentally friendly and enable the business to deliver a truly ‘green’ customer experience. We have created a place where boys can hang out. 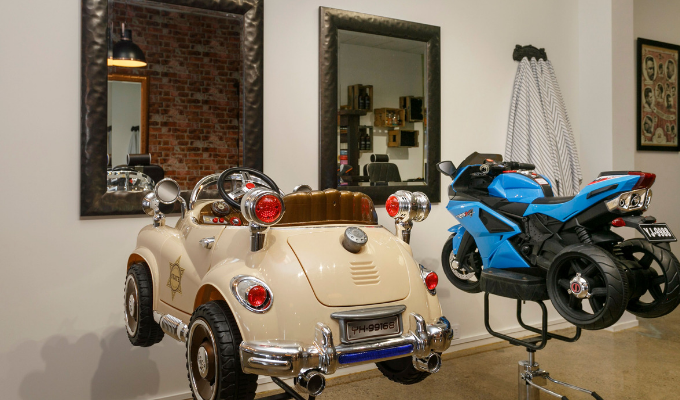 Fathers and sons come along together to have their hair done – Dad relaxes in the leather backed traditional barber’s reclining chair while his son can choose from a vintage car or a motorbike to sit on. This has proved a huge hit, and does a great job in keeping children still and safe while getting their haircut. 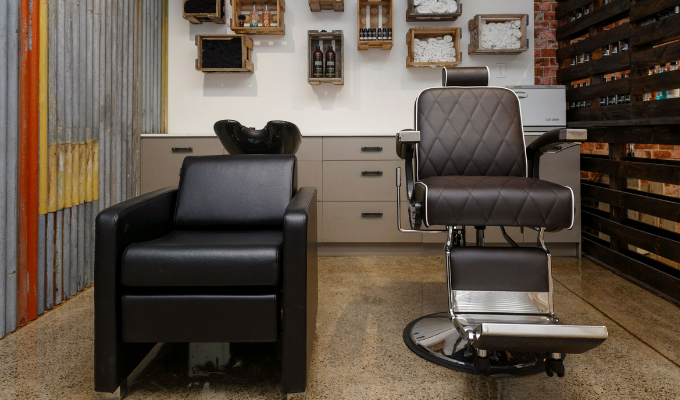 Space was allocated for three barbers chairs each positioned in front of large copper framed mirrors. As the floor plan was a long rectangle, a barrier was needed to add visual interest but also to create a more private space for hair washing. This had to be big enough to fit an additional chair as well as a reclining hair-wash station. The entrance needed to be open and inviting, a place people felt comfortable to wait. Finally, to attract little boys, as well as big ones, we needed a cute, fun kids area. We are always looking for ways to extend the sustainable theme. The recycled wood gift vouchers were a way to give customers a sense of MANCRAFT before they even arrive. They are rough and rugged, and recycled so that they can be re-sold to new customers time and time again. Where did you source the material for your barbershop from? We began with recycled materials, for example, old wine barrels from a Hawkes Bay winery were made into wet shaving sinks, old beer crates were mounted onto the feature wall for product shelving and we were lucky enough to source 50 year old wooden planks from a local jetty which we used for more product shelving and the top of our bar area. Our feature wall on the outside of the grooming den was lined with recycled rustic tin which was sourced from a local business that closed down. The rusty red colour of the tin, added a sense of warmth to the salon’s environment. Recycled steel frames were sanded back and made into waiting benches. A wooden dividing wall was constructed using discarded pallets. An old reception desk was also sourced which had an incredible hand carved wooden top and this was then lined with more recycled tin. Time was also spent visiting second hand shops where antique cut throat shavers, hand clippers and an old telephone were found. These are now proudly displayed around the space, adding to the rustic look and feel. 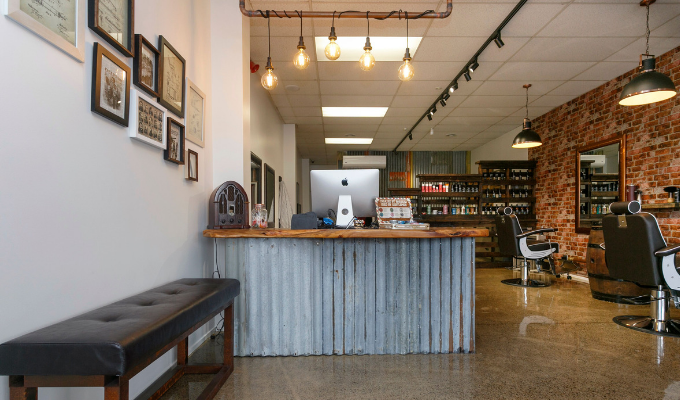 How do you feel your barbershops design has made you and your business successful? We achieved our vision by not compromising. We knew that to truly create an authentic customer experience, the environment had to look and feel masculine, sustainable and rustic. As the build progressed, we focused on recruiting suitably qualified staff and sourcing products with biodegradable packaging. We held out to hire the awesome team that delivers the MANCRAFT services today. The whole customer experience makes sense – right down to the products we sell. The result today is that everywhere you look within MANCRAFT you see just how much we value sustainability, and how much effort we have put into creating a space where men feel at home. The best result, and one we did not see coming, is that our team love where they work. The space is cool, comfortable and classy – there’s always a great feeling within the salon. This spills over onto our clients who just keep on coming back. What would you say to salons, spas and barbers considering entering The Industry Awards in the future? The Industry Awards are such an incredible way to actually stop and have a closer look at your business, which is so beneficial to your future growth.